The Center for Urban Education uses disaggregated data, and one-of-a-kind innovative and user-friendly data tools, including the Vital Signs and BESST. CUE disaggregates data by race and ethnicity, with specific racial-ethnic groups defined by the institution of system’s unique student population demographics. The Vital Signs is a tool that provides a visual representation of the starting point when investigating system or college equity. It breaks down large data sets into smaller, disaggregated ones and presents them in an accessible manner. In other words, it provides a snapshot of “baseline” or current student performance. These data allow faculty members, counselors, administrators, and others to see where inequities are occurring. They draw attention to issues where policy makers and educators must intervene to produce equity in educational outcomes for underserved populations. Each perspective has several standard indicators, selected to represent key points of student progression. For example, in Access, indicators can include the total number of applications submitted by fulltime students, the total number of fulltime students admitted and the total number of such students who enrolled. The Vital Signs, illustrated here for the Access perspective, provide a snapshot of “baseline” or current performance data. 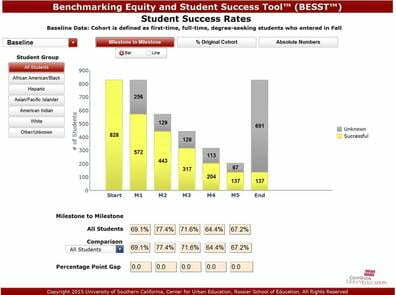 The Benchmarking Equity and Student Success Tool™ (BESST) is a web-based data tool which allows evidence team members to see their institutional data in graphic form and to interact with the data findings to set short- and long-term goals. The BESST™ makes college completion goals real and actionable.